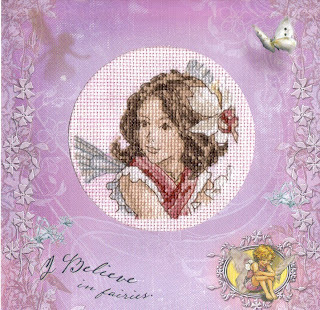 Serendipitous Stitching: Flower Fairy Finished! Finally, I have finished the Cherry Blossom Flower Fairy that was the cover kit with WOCS 176. I have moaned so much about this kit elsewhere! The threads were a nightmare to sort, so many shades of brown, beige and cream. I had to compare and contrast with my DMC stash to get them all right in the end. I made a couple of changes in the backstitch, grey for the wings and red for her dress. I also coloured the aida in before I started stitching using a nice pale pink felt tip pen. Then I backed her with pink card which gives a lovely pink hue to the fabric. I shall experiment more with colouring aida scraps when I do some card making as it seems to work quite well. The mount came free with the magazine, they actually charged people an extra £1 this issue but as a subscriber we get it all for the same price which is nice. Sarah-Beth is having a needlebook exchange and one of the joining-in conditions is to tell her your first finish. So I rummaged through the cupboard in the small boy's room and found a box of my early work. These two are my first ever finishes, I can't remember which was the very first, they are like twins! As you can see they are beautifully framed in click-frames - no expense spared! If I find a space for them I will reframe in something much nicer. Actually, you can't see the click-frames cos I took the glass off to photograph them!﻿ I think they are DMC own brand and I did the blue one first because I prefer it now. Has anyone else got pictures of their very first finish? Leave a comment and put a link to the picture. I took a few more photos this afternoon and uploaded them onto Picasa. My online photo album is a little scary now, there are 85 photos in the pre-2011 album alone! And that doesn't include all the projects I've given away. I have my 20 year anniversary in 2 years time, wouldn't it be great if I could achieve 200 projects by then! I have photos of over 100 so far, all I need is a list of the finished but not photographed and I could see how many I need to stitch by the end of 2013. Awesome pics. I will go find my first and post it too.Thanks so much. It was framed but had started to spot - obviously wasn't a needlework specialist that framed it :( Not sure what to do with it now. Might turn it into a cushion. Oooh, my first finish. A little fridge magnet I think, or was it the butterfly I sticthed? Both were done while I was at school in the early 90s! Your first 2 finishes look lovely. Love these first finishes stories. Jo has reminded me that techically my first finish was in Year 2 at Primary School (age 7) when I stitched a mat on Binca for my Mum. It had a house in the middle and several nice borders. She probably still has it. It used to be on top of the TV with a photo on it but they have a flat screen now! Freddy's Mama - that was quite a complicated first stitch! Love your two first finishes Jo!! Those click frames actually work perfectly with them! !